October | 2010 | Stop Human Trafficking in Southern Africa! 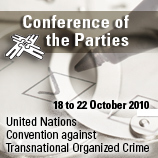 14 October 2010 – Progress in international efforts to address transnational organized crime will be the focus of the fifth session of the Conference of the Parties to the United Nations Convention on Transnational Organized Crime. A decade after the adoption of the Palermo Convention, as it is also known, States parties are meeting in Vienna from 18 to 22 October to take stock of efforts to fight this scourge. The Convention, together with its protocols on trafficking in persons and firearms, as well as on migrant smuggling, forms the legal basis for international cooperation against all types of serious crimes. Ministers and officials from Member States will address a wide range of issues requiring effective legal responses, law enforcement and criminal justice, including new and emerging issues such as environmental crime, trafficking in cultural property and cybercrime. So far, 157 States have ratified the instrument, which forms the global basis for extradition and mutual legal assistance. As such, it represents a powerful tool for cooperation against criminal gangs, their ringleaders and mafia networks operating worldwide. The agenda is available at http://www.unodc.org.